Engineering leaders interested in improving their profitability need to understand how the Theory of Constraints can improve engineering productivity and perhaps most importantly under what business conditions. This post reviews the evolution of throughput methodologies from where they were first applied in the manufacturing environment to newer approaches evolving for engineering, new product development, and R&D where the business goals are improved profitability and new value creation for growth and competitiveness. Eli Goldratt’s book The Goal (1984) helped a generation of manufacturers understand the operational principles underlying the Toyota Production System and Lean Manufacturing. Goldratt defined the goal as improved profits and clarified the operational rules for running a plant to be in order of priority throughput, inventory, and operational expense as opposed to pure cost cutting that lead to localized optimums and poor profitability results. He explained how the Theory of Constraints (TOCs) when applied through these operational rules can improve the profitability of a manufacturing operation with stable input demand. The TOC was first applied to manufacturing operations that can be characterized as a repeatable network of dependent events with processes that are subject to statistical fluctuations. The TOC focusses on system constraints to improve throughput, inventory, and operational expenses in the total production system. The key conditions that enable the TOC to achieve results in manufacturing are stable demand, moderate to high volume, repeatable processes, and a small range of products. Eli Goldratt’s paper Standing on the Shoulders of Giants (published with The Goal) went on to clarify how certain production environments and conditions can become unstable leading to marginal improvement gains from applying TOC. In this paper Goldratt described the Hitachi Tool Engineering case where the firm had limited success with lean manufacturing because of their unstable production environment conditions. The first two unstable production environments fall within the means of a manufacturing company to manage because the production system can still be characterized as a network of dependent events with processes that are subject to statistical fluctuations. Full productivity gains are not achieved because of how the production system throughput reacts to the unstable input demand due to dynamic mix of products, too many different products, or how dynamically the input demand of different types of products results in unstable overall load on the system. Goldratt explains how a time-based application of supply chain approach of TOC in a method called Drum-Buffer-Rope system can achieve improved performance for the first two conditions. Goldratt observed that low touch time production environments (Touch Time <<< Lead Time) provide enough margin to still exploit TOC benefits. The third unstable production environment, short product life, emerged in the 1980s from the increased pace of technological change on manufacturing operations. The turn time (lead time) performance of engineering, product development, and R&D became a factor for product companies bringing attention to knowledge worker productivity. Goldratt observed that product development systems do not exhibit processes that are ‘network of dependent events with processes that are subject to statistical fluctuations’. Each new product develop effort tend to have a unique network of dependent events with high variability which is consistent with a a project environment. Goldratt also observed that the project environments also exhibits time compression where touch time approaches lead time (lead time ~ 2 to 3 times touch time) of the project which degrades project environment throughput. To solve the unstable project environment problem Eli Goldratt went on to develop the Critical Chain method in the 1990s. The Critical Chain method adapts the TOC to unstable project environments with a particular emphasis on engineering development projects. In much the same format as The Goal his book Critical Chain (1997) explains how the Critical Chain method achieves improved project performance over Critical Path methods. The goal of Critical Chain method is to improve the flow (throughput) in project environments for stable and unstable project demand. 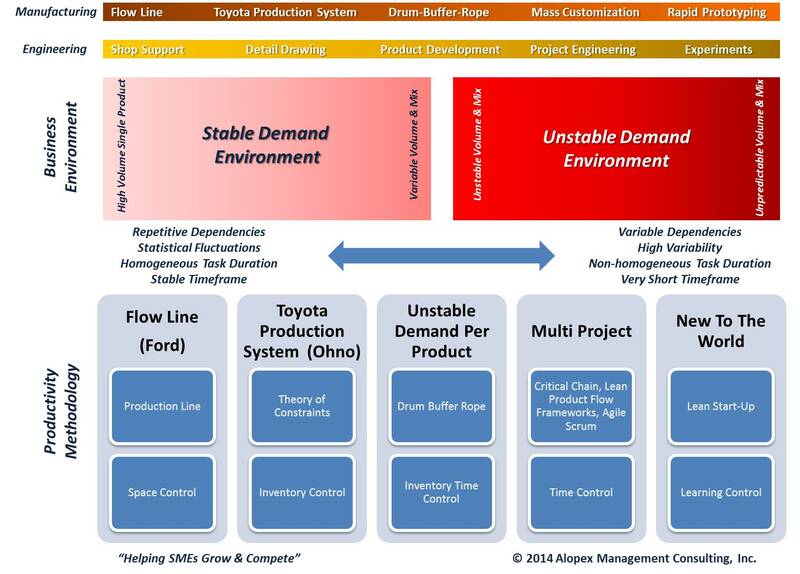 The mental jump from manufacturing production environments to project environments is helped when one considers that most project environments are multi-project environments. Throughput in a project environment is understood to be the flow of projects (and their activities) of various degree of: sizes, durations, complexity, uncertainty and novelty. The Critical Chain method seeks to maximize project environment throughput by managing feeding buffers and capacity buffers within the project and drum buffers and capacity buffers between projects. The Critical Chain methods use of buffers (time & resource) to improve productivity by reducing Work In Process (Design in Process), manage bottleneck resources, not allowing multi-tasking of resources, staggering projects along the constraints, prioritizing projects, and resolve resource conflicts on the system level. Tendency for engineers to ‘pad their estimates’ to give local safety margins that degrade the efficiency of the project environment by use lumped buffers (rather than activity-by-activity risk buffers) and focussing less on individual activity time performance. Overcome the tendency to think locally (within the project or a work area) by encouraging global thinking by avoiding multitasking. Manage ‘student syndrome’, the tendency for humans with time buffers to start their tasks later and waste safety margins. Manage ‘Parkinson’s law’, the tendency not to finish tasks ahead of time even they have a chance to by removing activity padding. Minimize the individual project owners pressure to execute first (local optimization at the expense of the global performance) by adopting a priority system. An excellent review of the Critical Chain method can be found in a 2005 paper by Lechler, Ronan, and Stohr with some useful simplifications that make the method more practical. Donald Reinertsen developed a parallel set of work to Goldratt that explored and clarified much of the underlying principles of lean product development from the perspective of achieving faster time-to-market in the project production environment. Reinertsen’s books Developing Products in Half The Time (1991) co-authored with Preston Smith, Managing the Design Factory (1997), and The Principles of Product Development Flow (2009) explored an economic model for design, queues in product development work, management systems, managing risk, lean engineering principles, and performance metrics more appropriate for the paradigm shift from the traditional utilization based management paradigm to a throughput management paradigm for engineering, product development, and R&D. Reinertsen also defines Design in Process (DIP) in the project production environment since inventory is measured in terms of information in the knowledge work space. The abstract nature of information inventory and visualizing how it flows through a knowledge based work environment has probably been the single largest factor holding back the broader adoption of lean product development. Reinertsen clarifies how the project production environment differs from the manufacturing production environment with repeatable network of dependent events with processes that are subject to statistical fluctuations to one with high variability (uncertainty, learning, experimentation), non-repetitive (every project network is different, sometimes completely), and non-homogeneous task durations (most tasks slightly different each time). Reinertsen’s most recent book Principles of Product Development Flow in particular explores the themes of cadence, synchronization, flow control, WIP constraints, batch size, exploiting variability, queue size, fast feedback, and decentralized control to maximized throughput. Although these works provide a vast array of tools it is difficult to see the big picture framework suitable for practical implementation. Ronald Mascitelli, Timothy Schipper and Mark Swets went onto develop fully integrated lean product development frameworks that operationalized the principles for engineering leaders who are responsible for new product development. Most importantly they describe how to fully implement a multi-project production environment based on the all the preceding methods but appropriate for actual business environment. Ronald Mascitelli’s Mastering Lean Product Development (2011) is perhaps the best integrated framework for the engineering, product development, and R&D leader to establish a throughput managed multi-project production environment. Mascitelli’s framework is an event-driven process incorporating practical lean methods to achieve the goals of improved profitability and new value creation for growth and competitiveness. Timothy Schipper and Mark Swets published Innovative Lean Development (2010) to describe an equally powerful integrated framework that leverages fast learning cycles and rapid prototyping for project production environments with high uncertainty. In the digital information age as products have become software driven and in many cases entirely software based the agile scrum methodologies have operationalized software product development emerging in early 2000s. The abstract nature of software development defied reliable engineering management methodologies before the emergence of agile scrum. With agile scrum software productivity is more manageable, efficient, and effective. Software driven products require the integration of the agile scrum methodologies within the project production environment framework just described. Up to this point in the post we have looked at how established companies with existing demand can exploit the TOC for improving throughput, inventory, and operational expenses to improve profitability in knowledge work. Finally Eric Ries operationalized new-to-the world lean product development (particularly digital offerings) for start-up founders in his book The Lean Start-Up (2011). This is the extreme unstable demand case. Ries describes how to measure productivity as validated learning for fast iteration and customer insight to find the scalable business model before cash runs out. Application of lean principles such as small batch size in the form of minimum viable product, build-measure-learn loop for fast feedback, metrics, and adaptability to find product/market fit. Ries observes that The Lean Start-Up is also applicable within existing companies for use by intrapreneurs who may be creating new value with new-to-the-world products because this is also the extreme unstable demand case. Selecting the right methodology to drive business productivity requires leaders to understand their business environment and the stability of their demand environment. The diagram below helps to characterize application & business environments. The diagram illustrates that in both manufacturing and engineering that the nature of the work can fall into a range of demand conditions. A key lesson from this review is that leaders should seek to throttle/smoothen (WIP Constrain) the input demand conditions if productivity improvements results are to be achieved. All the available methodologies are based on the concept of flow and maximizing throughput and managing inventory (physical or information), and operational expense to achieve business the goals of improved profitability and new value creation for growth and competitiveness. As Goldratt emphasized time and again effectiveness of these methods depend the key underlying condition of stable input demand or constraining the process input demand to ensure stable flow. As demand conditions become unstable lean engineering methods have been developed by Goldratt, Reinertsen, Mascitelli, Schipper, and Swets. Ries has described how new cash flow streams can be created in a lean fashion in the extreme case where demand does not yet exist. Finally a common theme throughout these works is the fact that cost accounting methods and data tools are ill suited to measure throughput, inventory, and operational expenses to achieve business the goals of improved profitability and new value creation for growth and competitiveness. Goldratt explores this issue at length in The Goal why a blind focus on cost reduction leads to bad performance. This problem has continued as throughput and TOC methods have evolved in the information age as pointed out by Reinertsen of the invisibility of DIP because of how R&D expenses are recognized at the time the money is spent. Information inventory and intangible assets remain as a problem for cost accounting and business performance management. This will be a topic of future posts. This entry was posted in Engineering Delivery, Engineering Leadership, Engineering Productivity, Lean Engineering, New Product Development on February 21, 2014 by Andrew Reif.